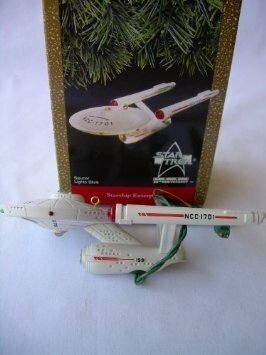 MIB 1991 Hallmark Ornament Starship Enterprise Star Trek Magic Blinking Lights. This is the 25th anniversary edition which features Magic blinking lights. This unique ornament, with its bright blinking lights, commemorates the 25th anniversary of Star Trek and celebrates the holiday season. Ornament plugs easily into any of the light bulb sockets on a miniature tree light string. Complete display instructions enclosed. Item length is 5.5 inches.